PHILADELPHIA—It was only fitting that Shen Yun Performing Art’s last North American performance, on May 10 in Philadelphia’s Merriam Theatre, was completely sold out. Audiences around the world have lauded every performance. Some are moved to tears others are left completely speechless. Shen Yun was established by a group of leading classical Chinese artists in the United States who saw that 5,000 years of traditional Chinese culture was at risk of disappearing in communist China. They created Shen Yun in New York to revive what’s considered the true, divinely inspired culture of China, and are sharing it with the world through the universal language of song and dance. Because of this mission, Shen Yun can tour everywhere, except in China. 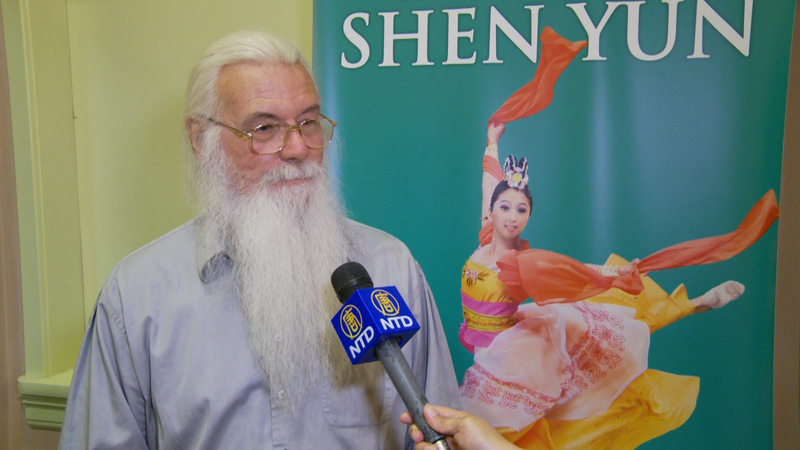 Around the world, Shen Yun has become a sensation. Since its inception in 2006, Shen Yun has grown fourfold. Today, there are four companies, including full orchestras, that tour simultaneously around the world, performing at some of the most prestigious venues—such as the Lincoln Center in New York, Kennedy Center in Washington, and the London Coliseum. During the 2015 season, Shen Yun performed 411 shows in 124 cities, across 18 countries. It might be a little overwhelming to imagine what it feels like to experience 5,000 years of Chinese culture in just two hours. Audiences across the world have talked about leaving a Shen Yun performance feeling educated, enlightened, and wanting to learn more about China’s rich heritage. This heritage displayed by Shen Yun includes some of the vast array of ethnic and folk dances that exist across the country. Coleen Dowd, who attended the final performance in Philadelphia, was completely enthralled with these dances. 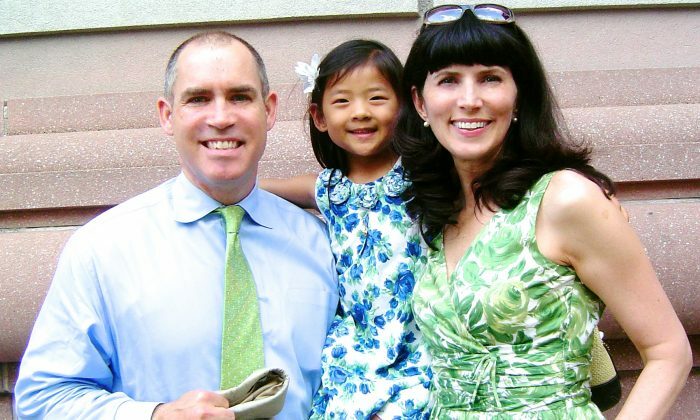 She attended the performance with her husband Michael Dowd and their 5-year-old daughter Kate, whom they adopted from China. “We wanted to expose Kate to some traditional Chinese culture,” said Mr. Dowd, a physician’s assistant at the Presbyterian Hospital in Philadelphia. Mrs. Dowd works at the Children’s Hospital. The ethnic dance “In a Village of the Hmong” was particularly special for the family since Kate was born in the region it depicts. In the piece, the female dancers’ ornate silver jewelry jingles and tinkles to the sounds of a cheerful drumbeat. The couple got Kate a similar necklace. “Hers says ‘luck’ and ‘long, healthy life’ on it,” shared Mrs. Dowd. The Dowds have always been interested in China, so much so, that they’ll soon go back there to adopt another daughter. 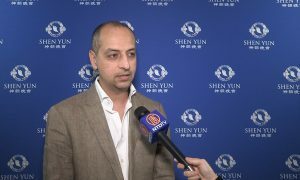 They said they understood why Shen Yun wanted to introduce the world to traditional Chinese culture and classical Chinese dance, which is not possible in the mainland. 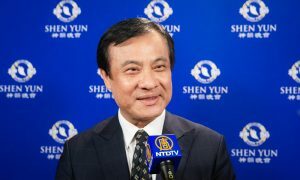 One aspect of contemporary China Shen Yun portrays, which adds to why the company cannot travel to China, is the story of Falun Dafa. Falun Dafa is an ancient meditation practice based on the principles of truth, compassion, and tolerance—it has been brutally persecuted by the communist regime in China for almost two decades, and is still being persecuted today. “I also had a new appreciation for the struggles of what it is like to be a person of religion and the new Chinese government and how things changed when communism came in,” Mrs. Dowd said. Patricia Mulqueen, Northampton County Assistant District, also commented on a dance that depicts how Falun Dafa followers are persecuted, yet no matter what, compassion prevails. “That’s a really basic lesson that everybody can use, it’s timeless, we need to be reminded of that all the time,” said Ms. Mulqueen. “I’m glad that they revived it,” she said. “I’d like to see what they do next year,” she said. 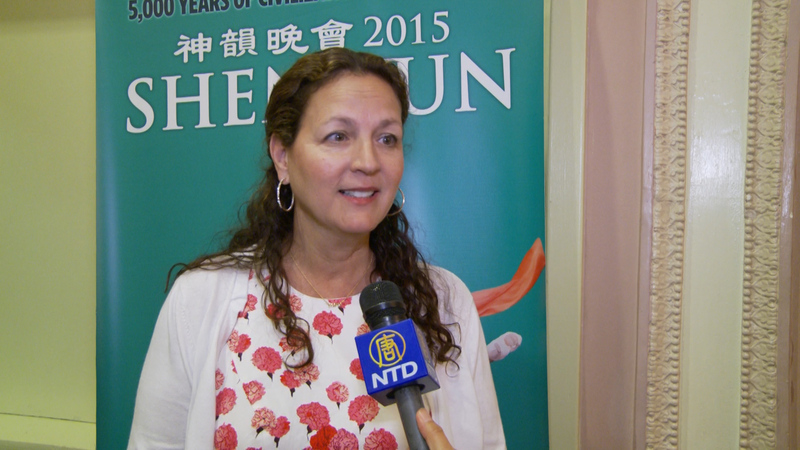 Many audience members express that Shen Yun has a profound impact on them. “I would have to say, in my whole life, this is probably one of the most meditative shows I’ve ever seen. I just felt so relaxed and peaceful watching this, it was a great, great experience,” said Gale Leonard, who works in marketing. “It took our breath away,” she said. Ms. Leonard attended the performance with her friend Sheryl Eckhart, a pharmacy technician. “The show was spectacular—it just made us smile, it made us relax. The beauty of it, the precision of everybody, it was really just a magnificent show,” said Ms. Eckhart. Through portraying stories from classical Chinese works, Shen Yun revives the basic values that were the foundation of ancient Chinese culture, such as reverence for Gods, loyalty, propriety, kindness, and faithfulness. 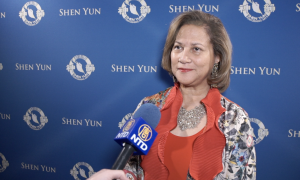 “I think the Asian culture, compared to our culture, there’s a spirituality that we don’t have, that we need to get… [Shen Yun] is a good lesson for life,” Ms. Leonard said. To recreate ancient China and bring to life timeless stories like from the classical Chinese novel “Journey to the West,” Shen Yun created animated backdrops using state-of-the-art technology. The backdrops, which span the entire height and length of the stage, become an extension of the stage transporting the audience into completely different realms with every piece. Joe Griesbach, a film and digital projectionist at Frank Theatres Corporation in South Jersey was amazed with the backdrops. “Well, the whole show was amazing, but the digital background… that was pretty impressive,” Mr. Griesbach said. “It looked like HD 3-D to me. … It’s better than our 3-D, and in our theaters you have to wear the glasses for 3-D,” he noted in admiration. 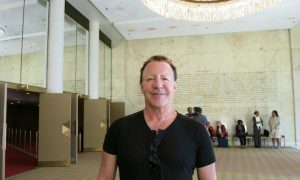 For Mr. Griesbach, Shen Yun was the best live performance he’d ever seen. “I’ve seen live stage before, but not as good as this,” he said. “The dancing, the timing is so good, so good, … Ah, the music, those guys are right on key,” he said. 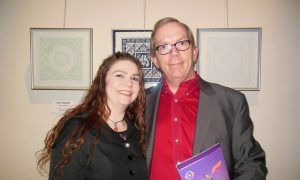 Mr. Greisbach drove two hours from south New Jersey to see Shen Yun for the first time. He says the trip was definitely worth it as he’s determined to come back next year. “That’s for sure,” he affirmed. 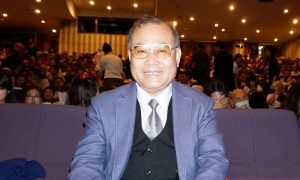 “I’d watch the same one again over,” he said, referring to the fact that Shen Yun produces an entirely new show each year. Shen Yun’s overview of 5,000 years of history starts with the story of the creator and brings us to the present day. Mandy Rosie, who teaches at the “All That Jazz Dance Academy” in Hamilton, New Jersey, has been dancing her whole life. “I thought [the dancing] was awesome,” Ms. Rosie said. Ms. Rosie was impressed with the unison and synchronicity of the performers. “It’s really cool to see everything come together, and all the colors were wonderful, and everything just went all together,” Ms. Rosie said. 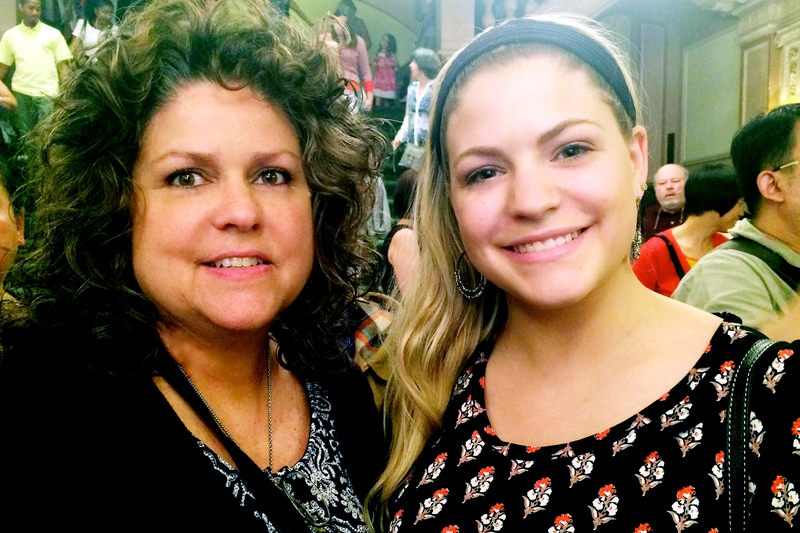 Rosie brought her mother, Cathy to the theatre for Mother’s Day. “I loved it,” Cathy said. Some theatergoers have waited years to see Shen Yun. At the final performance in Philadelphia, Laura Morrissey, a special education teacher, finally got the chance to attend and doesn’t plan to miss Shen Yun again. 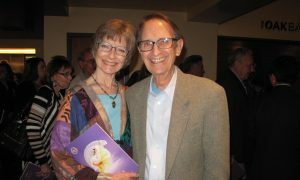 “I’ve wanted to see this [since] the first time [Shen Yun] came around in 2006,” said Ms. Morrissey, who brought her granddaughter as a special Mother’s Day treat. “It was wonderful, the costumes were beautiful, the dancers were beautiful, the sopranos were beautiful—everything,” she said. 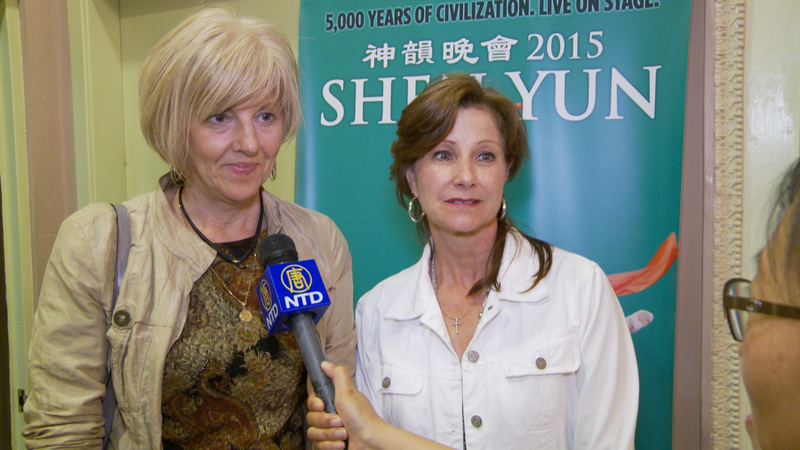 Yanna Brotzman brought her mother Natasha Brotzman to see Shen Yun for Mother’s Day. “We were endlessly impressed, just endlessly,” Natasha Brotzman said. “I was so impressed I don’t have enough words to describe what I feel,” she mentioned. 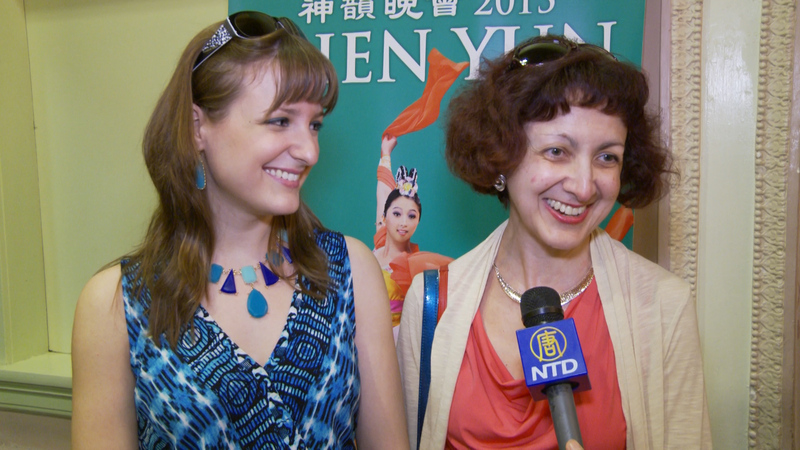 Natasha, a law office manager and Yanna Brotzman, a dental hygienist, were seeing Shen Yun for the first time. “This was a really amazing performance, the choreography, the dancers, the colors, the costumes, it was amazing,” Yanna Brotzman said. “We’ll definitely be back next year,” she said. “We will be waiting,” Natasha Brotzman said before parting.